Have you ever felt the look of hate? It’s hard to describe. Whether you’re Canadian, Chinese, Latin American, or Middle Eastern, there is someone in the world that doesn’t like you just because you “are different.” Christine (Chantelle Han) – the main character of Offensive Fouls – describes this feeling with passion to her naïve boyfriend, Joey (Cole Humeny). This 50 minute play explores how normalized racism has become in our culture through jokes, mannerisms, stereotypes, and even diet. Words themselves are neutral… so how do we know when what we say, believe or joke about is racist or hurtful? Sometimes things are lost in translation between the speaker and the listener. This is the problem Christine and Joey experience in the play. Joey thinks that Christine, born in Canada to parents from China, is not really Chinese. Christine disagrees. Meanwhile Christine thinks Joey, who comes from several European heritages, but identifies himself as Irish, is just another white boy who doesn’t understand discrimination. This disagreement puts their relationship in jeopardy after a local Chinese store owner is harassed by three young men. This is the impetus of a discussion about how these teens identify themselves, and where the boundaries of their culture are in a multicultural society. In Canada, we get to experience a plethora of cultures every day – we drive a Honda to work, eat Thai food for lunch, and watch American entertainment in the evening, but when we talk about these cultural objects – what’s the right way to do it? As a Canadian who has never experienced racism, I (Jenna) was drawn into Christine’s tale about the discrimination she faces on a daily basis. I began to examine my own history in having conversations about race. In small town Saskatchewan, the concept of race didn’t enter my education or social interactions. Consequently, I came to university believing that people who aren’t racist don’t talk about race at all. I remained thinking that for 3 years, until one of my Chinese friends brought the concept of race into our conversations. At first, I was uncomfortable with those discussions, but I realized that by talking about race in a sincere way, we take away the fear that this topic inspires in so many people. 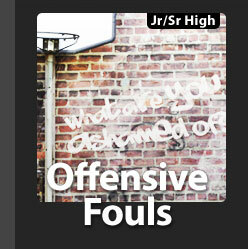 That’s what Offensive Fouls did for me. As a Mexican (Ana) in Canada, my culture is a huge part of my identity. Before leaving Mexico, I seldom thought about Mexican stereotypes and negative portrayals of my culture until my first visit to the United States, where I was discriminated against, not by the color of my skin or the shape of my eyes, but by the words written in my passport. Coming into Canada, I was exposed to more stereotypes and to curious questions from those who had only experienced Mexican culture through tacos and tequila, I learned to embrace the Mexican stereotypes and even joke about it. But when is it offensive? When are the comments racist? So who do I label racist, and why? Christine made me question my own beliefs behind racism, and to reinterpret my own prejudices. Racism is too broad of a subject to figure everything out in just 50 minutes. But the play offers an interesting insight to the double standards that are engrained in society. Racism is racism when someone says it is. It’s all in the fine print.